Yes, yes. I know. Old joke. But. I have to share an absolutely delicious outcome involving fresh halibut that I picked up at the market yesterday and served for dinner last night. First thing you need to know about me is that I often do not plan menus in any great detail and have to rely on whatever ingredients I have on hand. Because I make up recipes and improvise techniques, I sometimes have happy accidents. Such was the story of yesterday’s halibut. I had a leek. I had bacon. I had the beautiful halibut filets (about 5 oz. each, skin off, one inch thick). First, I cut four slices of bacon into quarter-inch strips and fried them until they were crispy, then removed them from the hot rendered fat with a slotted spoon onto a paper towel-lined plate. While the bacon was frying, I trimmed off both ends of the leek, sliced it in half lengthwise and rinsed it clean before slicing the white and light green parts (crosswise) into thin strips that I sauteed in the bacon drippings until they were tender. I removed the leeks with the slotted spoon to the same lined plate to drain. By now, there was just a thin coating of bacon fat still in the skillet. I raised the heat until the fat was just smoking. I sprinkled one side of the halibut filets with kosher salt and both sides with fresh ground black pepper. I pan seared the halibut until it was golden brown on the first side (about 2-3 minutes) and turned the filets once, cooking them for another 2-3 minutes until the flesh felt springy-firm when I pressed it with my finger. Here’s where the happy accident happened (revealed below). I didn’t want the halibut over-cooked, but I wanted the filets to stay warm while I made the sauce, so when they were just cooked (as I described it in the previous paragraph) I moved them to a plate and covered them with foil (just as you would rest steaks before serving). Keeping my fingers crossed that they’d keep their nice crisp sear and not get tough. The sauce was easy — I melted 2 to 3 tablespoons of butter in the skillet that I’d used for the bacon, leeks and to sear the halibut. When it stopped foaming, I added an equal amount of flour* and stirred it for a minute or two to make a fast roux. When the roux was golden brown, I stirred in a cup of milk and kept stirring until the sauce was slightly thickened (it should not be as thick as gravy so add milk to get the right consistency). Finally, I added the crispy bacon bits and the sauteed leeks to the sauce. You could ladle the sauce onto the plate and arrange the seared halibut on top, or you can spoon the sauce over the filet. Or both — it’s so good, I wanted to eat it with a spoon. So, what’s the happy accident you ask? Well, apparently “resting” the halibut filets was exactly the right thing to do. The fish was tender, succulent and melt-in-your-mouth wonderful. This is my new go-to technique and I wanted to share it with you. Hmmm, we need a wine pairing for this don’t we? My recommendation is a buttery chardonnay or a good French chablis, although the latter can be very pricey. Still, if you’re spending $25 a pound for fresh halibut, a good quality wine is the least you can do out of respect for the fish. *Because I am a celiac, I used an all-purpose, gluten-free flour blend to make the roux for the sauce. For anyone who wants or needs to eat gluten free, you can buy an all-purpose GF flour ready made; there are several varieties available at your local grocery, to include Bob’s Red Mill and 1-2-3 Gluten Free, but a really good one is C4C (Cup for Cup) from Chef Thomas Keller of The French Laundry restaurant. My homemade blend is one cup each of white rice flour, sweet sorghum flour, tapioca flour, cornstarch and almond meal/flour. 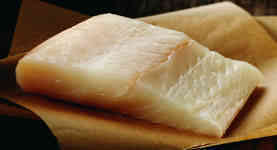 Halibut is a truly fine fish. If one can get it fresh, it is a real treat. Your description of preparation makes my mouth water. I would be in favour of the Chardonnay. Thank you, Conor! I love halibut and watch the season closely to make sure I get it while it’s fresh; we’re very lucky to live in the mid-Atlantic region of the U.S. and are able to get fresh fish regularly. You are dead right, the chardonnay was outstanding. My favorite fish, Connie. It really is wonderful. sounds like a great dinner! Leave a reply on "Just for the Halibut"